After you have created an account, log onto the system (Chicago Edge Bonzi) with your email and password that you have set up in the previous step. If everything is set up correctly, you should see a folder on the left side that represents your team. When you click your team, you should see the team members on the right side and below it the game schedule. Girls teams – your league is the Illinois Women’s Soccer League (IWSL) that operates under the umbrella of Illinois Youth Soccer Association (IYSA). To log in use your email and the password: LUEVH911. This will take you directly to your team’s page on the website. IWSL only allows one person to be listed as a team manager, so if you co-manage you will need to share your username (email) and password. Most problems accessing the website can be fixed by simply logging in "the right way". It is possible to enter the system through other "doors", but the most reliable option is the top right Sign In button when you arrive at http://chicagoedgesc.com. So please try this step as a first problem solver. Some browsers don't save email/passwords up there. We had good success simply leaving those log in fields blank and hitting Return - the subsequent login page usually does save your login information, so you don't have to retype every time. If you forgot your password, click the top right Sign In button, enter your email address, leave the password field blank and click the Log In button. You will receive and email with the option to reset your password. Once logged in, click on Admin (also top right). Click on anyone in your family to update their contact info. The cell phone tab lets you add a cell phone provider, so that you can receive text alerts about game reminders or changes. Encourage parents to update their account themselves, but know that you can edit team members' accounts as well. Team Bulletin will appear on your team webpage and you can also include that it be sent as an email to your team. Email Members gives you several options to reach your team. You can choose Send Email and when you hit Find Members it will present you with a window to write your email. There you also have the option to exclude or add recipients. Another feature is to be able to send text messages. Select Send Email & Text or Send Text Messages which will send text messages to all team members that have signed up for receiving text alerts on their account page. Your team members can contact each other by going to the roster page and clicking on another parent's name - that will reveal their email address. It is very important to know if you will have absentees for a game. No matter how often you remind your team members, you constantly will have to chase those RSVP responses. One way for parents to update their status, is to log in and click the Schedule tab on the team page. On the right side the Thumbs Up icon let's them update their status for a game and to see who else has RSVP'd (for arranging carpools). A much easier way to get RSVP responses is for you to go to your team's Schedule page (after logging in), then clicking on the Thumbs Up icon next to an event and then simply clicking the Send Email button above the No Response group. That will generate an automated email asking your players to simply click Yes or No, without having to log in. Contact information for girls teams can be found on the IWSL website when you click the opponent. Contact information for boys teams can be found on the NISL website. To get a complete list of all your opponents' contact information login to NISL, click on "Reports", choose "Schedule Reports", select your division and then choose "Page 2". When confirming your game make sure the game number, day, date, start time and field location is correct. If the location is not in our system, please contact to add it to the list. Ask your opponent if there is anything you should know regarding road construction or parking. You can also check on jersey color. Team managers and coaches need to work together to make any game changes. Please remember your coach needs to be able to make it to all their games each weekend so please allow time for them to safely drive to each location and warm up the team. You need to contact the office if you wish to make any home game changes (be it day, start time, or field). You can all see the empty time slots on the Master Home Field Schedule, BUT the empty game time slots do NOT automatically come staffed with referees. It is very difficult to make even minor changes without a week’s notification. We need that time to figure out which referees are available at the new game time, offer these referees the revised game time and hear back if they have accepted the revised game. Most of our referees work multiple games in one day so even a 15 minute game start time change can throw off the whole schedule. When you think of the referee schedule think of a big house of cards. The more we try to change this schedule the higher the likelihood we will have games with no refs and refs standing on empty fields. 48 hours prior to game time the system sends an automated email with game details. Unfortunately that email asks players again to RSVP, which might give families an idea to back out. Maybe remind parents that such late notices are not appreciated. If team members signed up for text alerts, then they will receive a game reminder text 2 hours prior to game time. Reminders will only go out for games, not practices. Go to your team's webpage. Click on Schedule. Click on the away field location. Click on View Facility Information. In the next window you will see the field address as well as dining/shopping options nearby. When you click the Map link, a Google map with directions from Oak Park will open up. All U9-U18 Chicago Edge teams will participate in a winter indoor league. U7 and U8 teams can sign-up for our optional winter indoor league. Most league play starts right after winter break and runs up until spring break. For U13-U18 league play will start in early November (frequently overlapping fall outdoor games) and run up until the IHSA deadline in late February for girls and up to spring break for boys. 1) Registration: The club’s Directors of Coaching choose the winter indoor league and the office will register/pay for each team at the appropriate venue. If you receive an email confirmation with an invoice attached please forward that invoice to the office. Team managers are in charge of communicating the game schedule to families using the team’s page on the Chicago Edge website and making sure there will be enough players for each game. There are no player passes, no game cards, no referee payments and all equipment is set up on the field. 3) Game Schedules: If any games need to be rescheduled the coach will contact the facility. Please remember that there is very limited space indoors and game changes are hard to do. Your schedule will most likely change as the season goes on even if you do not initiate any changes due to other teams making changes. Make sure to check the facility webpage periodically to spot any game changes! 4) Facility Requirements/Game Rules: Each facility has a set of rules to follow. Most do not allow players to wear cleats on the turf. 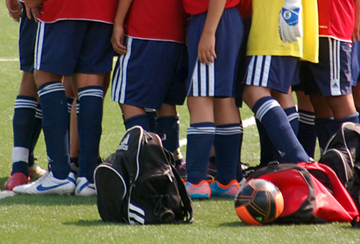 Players can wear indoor soccer shoes or athletic shoes. Generally only water is allowed on the field. Depending on the facility where your team is assigned, the rules of the game may be different from the outdoor rules. Frequently subbing is on the fly and often times there is no offside rule. You will want to direct your parents to review the indoor league rules to avoid confusion. U9-U14 Teams: Each team will have one winter indoor team practice per week starting after winter break and running up to spring break at SportsZone in Melrose Park. U7-U8 Teams: Players on these teams will be offered an opportunity to sign up for optional winter indoor training at SportsZone. High School Teams: For high school players, winter indoor team practices will begin in early November and run up to the IHSA deadline in late February for girls and up to spring break for boys. The coaches would like for the players to wear their full navy uniform to all games and keep the red jersey as the alternate in their bags at all times in case of color conflict. You can ask your opponents what color they will be wearing and let players know in advance if they will need to come in their red jerseys. 1) Player Passes (all games) – give to center referee who will hold until after the game. You must get them back once the game is over. Referees are often rushing to their next assignment so be fast. 2) Game Card (all games) – you will find these on the league website once you log in (NISL or YSSL for boys and IWSL for girls). On the NISL website log in and go to your team folder. On the right side you should see your games on the bottom. You will need to add your rostered players for every game (Game Day Rosters) and then you can create/print the game card. For IWSL and YSSL login and there is the link for the game card right on your schedule. I suggest printing them all out now and putting them in your team binder. You give this form to the center referee along with the player passes. The referee will record the official game score and send this form to the league. You can print that screen to take to the game. 4) Goalie Gear, first aid kit and game ball (all games) – please work out with your coach who will be holding these items. Keep in mind that if the team manager holds everything they need to make sure someone else brings it in their absence. Goalie gear might be best left with the coach. It can then be used for practices as well. If your team is playing home games on a River Forest field (Priory, Keystone or Washington) you will need to set up and take down the corner flags for each game. The office will let you know each week if there are multiple games on the fields so that the team with the first game sets up and the team with the last game takes them down. If your team is playing home games on an Oak Park field the team manager is responsible for bringing the corner flags, setting them up and taking them down. Please note that only turf (yellow base) flags can be use on all turf fields. There will be a box at Ridgeland Common that we will have a key for where flags can be stored. PLEASE NOTE that the last team on the field at OPRF High School's Lake St field will need to roll away the goals and lock them to the fence along Lake street after the last game. There will be a key oin the cub drop box at 625 N Elmwood to lock them up. 6) Portable Goals (home games for U8 only) – all U8 golas are portable and net left up except on game days. There is a lock box at each U8 field that contains the goals and the corner flags. The first team of the day sets everything up and the last team of the day puts everything away. You need to bring cash to pay 3 separate people at each home game – exact change needed and no checks please. Each team manager was given a check to be used to pay the referees. Optimally your referees will be at your game 30 minutes in advance. Sometimes we have to cut it closer than that as many referees are working multiple games each day. If it is 15 minutes before game time and no one has shown up, please call the assigned referee(s). If the goals are locked up on a Park District of Oak Park field (excludes OPRF HS Lake St field) you can call night maintenance at - 708-426-2720. 1) General Information: The track is still open to the public while we have the permit for games. People using the track will just need to watch out for balls. Please ask any parents who decide to watch from the track to please move to the stands or the grass. The adult league has the permit before ours on Sunday mornings. If you have an issue with them on the field at game time please have your center referee intervene and remind them their time is up. They also have a tendency to change their shoes etc sitting on the sideline of the field and are surprised when they get run over by players - just ask them to move back. 2) Corner Flags: You will need to use the heavy weighted yellow base flags. NEVER use regular corner flags on turf as you will destroy it. You can have your own set of turf corner flags or pick one up from Colette's house at 625 N. Elmwood for your game. Check the game schedule for the day and arrange with other teams to set them up once and take them down once as they are heavy. 3) Goals & Goal Key: The last team on the field will need to roll the goals to the fence along the NE corner of Lake Street (you will see another set locked to the fence there as well). The goals are heavy and will need several people to move them. There is a key (on a hook in the corner) in the club drop box on my front porch at 625 N. Elmwood for the padlock for these goals. Please lock them to the fence and return the key to the box. The chain and lock are huge and the key is real small, but they work. You must return the key to the club drop box as it is the only key we have. 4) Player Benches: You will also need to return the covered player benches to the wall along the train tracks when you are done (if they are out and being used). 5) Trash: Even though the field is open to the public, I will hear from the Athletic Director if the field has trash left on it when we have had the permit. Please pick up anything you see before you leave (or assign to a parent). 1) Coach from the sidelines for any reason. Your team's professional coach is in charge and only they know what the specific game plan is on any given day. 3) Talk to the referees or linesmen for any reason other than to say “Good Job or Thanks” at the end of a game. Yelling at the referees and questioning their decisions can get a parent ejected from a game and causes our young referees and linesmen to leave in droves. No one is perfect. Remember that most of these young referees are very knowledgeable about the game. We have put a referee feedback form on our website so team managers and coaches can give feedback - this feature is for team managers and coaches ONLY! You can find that form under the Referee Feedback tab under the Club tab. The password to submit a form is: refedge. -let the referee assignors know if a center referee or assistant referee did not show. -provide positive feedback as well as constructive criticism. The assignors will take that into consideration for their future assignments. Everything will be handled confidentially! 1) League: The center referee will report the official game score to the league using the game card (sometimes they are not so fast to do this so don’t be alarmed if your game score is slow to show up). 2) Chicago Edge Team Page: The team manager should update the team’s page on the Chicago Edge website with that weekend’s game score(s). You can do that after you log in by clicking on the Results tab of your team webpage. Clicking the little yellow pen will enable you to enter the score. Clicking on the green Sigma icon lets you enter the stats for each player. Stats will then be visible (ONLY TO TEAM MEMBERS) under the Statistics tab on your team webpage. But remember, you can only enter those under the Results tab. Note our little weather app on our home page (bottom right corner). Click on the link below the map Next 6-Hours-Radar Map to see the next hours on a radar map. Soccer is played in the rain and cold. If it’s a light rain, there will be practices and games. If there is thunder & lightning the players will be moved off the field to a nearby shelter if available. 1) Practice cancelations will be made using the club’s email system as early as possible (hopefully by 2:00PM) and the fields section of the website will be updated to show field status (green=open, yellow=watch for further notice via email, red=closed). 2) Home game cancelations will be made using the club’s email system and/or team manager contact depending on the number of fields closing. If your game is canceled due to weather you will need to reschedule with your opponent (girls team a weather related reschedule will appear on the IWSL website so you can reschedule your game). 3) Away game cancelations need to be confirmed as early as possible with your opponent. Your opponent will be responsible for rescheduling the game. Sometimes when the weather is marginal you just have to drive to an away game and hope for the best. Just because some home games are canceled does not automatically mean all home and away games are canceled that day! Cancelations are field specific and not all fields close at the same time. Every team page has a tab called League Standings, which displays an updated link to the division table. Once logged in, click on Multi-Schedule (under the Edge Travel Teams tab). Select the Schedule Type and teams you want to export (Notice the color choices). Hit Submit. You might have to click the Calendar choice at the top on the subsequent page. Copy/Paste that link into your calendar program. If you don't need the option of using different colors, you can simply click on Admin (top right), then click on Family Schedule and click the calendar export option you prefer. Team managers should be able to upload pictures with their normal login. Anybody else can also upload by using a different login: photoedge (use for both as username as well as password). Click on top right, under Admin-Tools-Picture Manager. Click Create New Album. Give it a name but make sure your team is selected. If you want, click on Make Files Available As Download. Once uploaded, you can find your pictures on your teampage under the newly created Pictures tab. Click here to access the system's team manager manual.